Whoop Whoop, six and a half months after moving here, and six frustrating visits to the DMV later: I have my (interim) driver’s license! 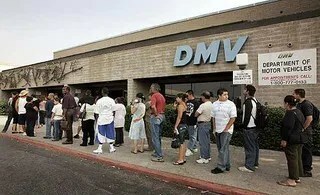 To save others the frustration and endless wait I had to endure, I thought I’d share some valuable lessons about the DMV I’ve learned along the way. To anyone who has never been to the US: Without a license, you’re not a complete person. Getting anywhere takes forever, or is downright impossible, and that makes you a social outcast. Plus, once you have one, you can finally stop dragging around your passport everywhere you go, because the license also works as your ID. There are positive things to mention, too: People here are remarkably friendly and happy to offer you a ride. That may not make you feel much better, because you hate being in someone’s debt or at someone’s mercy. But at least, you can count on help in an emergency. And at least in theory, it is easy to get a license. If you, like me, came to the US on a K1 visa, or are here without a greencard for some other reason: Do not wait too long before you get your driver’s license. There are legal presence requirements to getting a license, and if you don’t have a greencard, you will have to prove that you’re in the States legally, and for a sufficiently long period of time, in some other way. In my case, I needed my passport and a copy of my I-94. The I-94 is a record that is created every time you enter the United States. You never see it, it doesn’t get handed to you at the border. But you can print a copy yourself, for free, on Homeland Security’s web portal. The I-94 expires after three months, and for a license you need to prove that you will be in the States legally for at least another 30 days. So: Go get your license in the first two months after arrival! Another requirement for a driver’s license is a social security number. More precisely: You either have to have one, or you have to be not eligible for one. If, say, you are in the US on a Student visa, you are usually not eligible for a social security number, and therefore the DMV doesn’t need you to have one. But if you are theoretically eligible to have one – and if you entered on a K1 visa, you are – you must have yours to apply for a driver’s license. Getting one is even easier than getting a driver’s license. In theory. In my case, the Social Security Administration took my application and kept my documents (including the marriage certificate that cost me 15$ and that I only had one copy of), only to never create a record for me and to never send me my number. I waited in vain, and in the end had to get another marriage certificate for another 15$, go to my local Social Security Administration again, apply again, and wait another two weeks. Then, finally, I received my social security number and made another attempt at the DMV. So: Make sure you have your SSN before you go apply for a license! Lesson Nr. 3: Don’t come in too late. Or too early. The DMV is known for being a ginormous pain in the but, whatever you errand there, and regardless of whether or not you are a citizen. Think of the worst story you have ever heard about this particular government establishment, take it at face value, and then expect even worse. You will have to wait forever to get your errand done. You can save yourself quite a bit of time if you make an appointment online, but as the first available appointment is usually a month from now, this is not an option if you’re in a hurry. See Lesson Nr. 1 for why you should be in a hurry. So prepare yourself for an endless wait once you show up at the DMV with your I-94, your SSN, and/or any other documents you need to bring. If you’re clever, you’ll be there at least 30 minutes before they open, so you can be one of the first people in line. Yes, even an hour before they open, there will already be a line. But if you’re early enough, that might still be a short line. If you’re even more clever, you can come in shortly before they close and start hurrying everyone through – and this is a tip a fellow sufferer in the DMV waiting line shared with me. I have not tested this and cannot guarantee it works. According to her, the DMV officials will start moving down the line much faster towards closing time to get everyone taken care of. I can’t quite believe they’d dawdle all day, making you wait for hours, only to get hectic towards the end. But feel free to try it out. Guess what happened to me once I finally had the SSN, waited for months and months for the greencard, and was finally ready to try again? I got up at 6 a.m., rode my husband’s bicycle to the DMV, only to find that they were closed for the day. It was President’s Day, a holiday. You might think it serves me right, I should have known. Well, I checked their website to see if maybe they might be open, and among the list of national holidays they are closed on, President’s Day was not listed. The lesson here: Do not rely on their website for opening hours. Only go on a day there couldn’t possibly be a reason why they would be closed. And be prepared to still be disappointed. At my very first visit, I was told I needed to take the written driving test again, as my previous license had been expired for too long. However, I’d have to wait two hours for that, and they would be closing in one. Wouldn’t I want to come back early on another day? So I did, and the next time I was told there was no need to take the driving test. At attempt nr. 4, I was also told by one employee I could at least get an interim license and drive around with that until the Greencard arrived. I paid the fee, had my picture taken, and then was told by another employee I would not get a license. For anything they tell you: double-check. So, can I drive now? Yes, I can. At long last. At attempt 1 I was told I need to come back another day for a written test. At attempt 2 I was told that was not the case, but I needed my social security number. At attempt 3 I was told I also needed my I-94. At attempt 4 I was told there was not enough time left on it and I would have to wait for the greecard. At attempt 5 the DMV was closed. At attempt 6 I waited for 3.5 hours, but finally walked out with the interim license, and the actual license has since come in the mail. Success! And I’ll put that little yellow plastic card with a horrendous photo of myself to good use soon. For that, see my upcoming tale of a San Diego road trip! This entry was posted in Tips for Immigrants and tagged DMV, driver's license, driving, good driver's discount, Passierschein A38, tips for immigrants. Bookmark the permalink. I’m back. For real this time.